Dr Kamal completed his MBChB, DS & CABS (General Surgery) in 1986 and 2000, from Al Mustasiryah University, Iraq. He has worked as a Consultant General & Laparoscopic surgery in the Ministry of Health in Iraq for 20 years mostly in teaching hospitals and started his Laparoscopic practice in 2001. Dr. Kamal was promoted as Lecturer & Examiner (Consultant) for Medical Students and Postgraduate Doctors at Tikrit Medical College, Iraq in 2001. 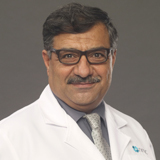 Dr Kamal received a Diploma in Minimally Invasive Surgery from IRCAD, Strasbourg, France in 2012 and moved to the UAE with over 30 years professional experience in General & Laparoscopic surgery. Furthermore, Dr Kamal has undergone training for Laparoscopic surgery at many advanced Laparoscopic Centers such as IRCAD - France, Al- Bashir Hospital and Jordan Hospital - Jordan, Damascus Hospital - Syria and Rashid Hospital in Dubai. He can converse with his patients in Arabic and English. languages known :Arabic and English.